The Wild Pack Band: Come Experience Baja with Wild Pack! Come Experience Baja with Wild Pack! The 2017 Baja winter season from January until May is going to be Bluestastic! Wild Pack is hosting a Baja and Blues Musical Adventure. A caravan of blues musicians and blues music fans will travel down the Baja from Rosarito to Cabo San Lucas. It is a 14 day tour that includes 9 concerts, four 300 year old Spanish Missions, the famous Baja whale watching (last year there were over 2500 whales in the bay - life changing experience), the Tin Church built by French architect Gustave Eiffel, of Eiffel Tower fame, incredible natural landscapes, unbelievable bays and so much more. 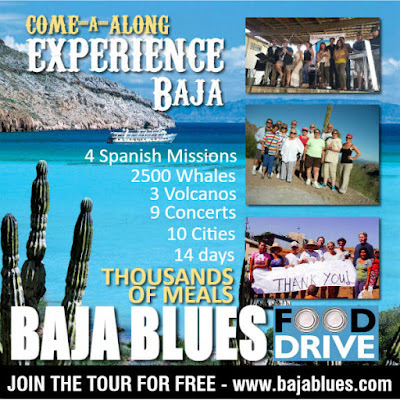 This is a COME-ALONG -TOUR being hosted by Blues Against Hunger and Baja Good Life Club. The goal of the tour is to share the passion of blues, feed the hungry, and see and explore the amazing history and beauty of Baja. So, we want to encourage EVERYONE that has not seen the Baja to join the tour. You can "come-along" for FREE, just follow us, or we can take care of everything hotel or camping. Come any way you can; pack your car with tent, ice chest and drum sticks (we'll have a kit), load up the camper, fuel up the RV, or saddle the horse. Whether you love blues, would love to see the entire Baja Peninsula, or just love to travel and meet new people, then we encourage you to join us and tell everyone else to join us too. We are going to share in the musical trip of a lifetime, and help those in need, while meeting new friends you'll have forever.